A delicious whole salami, packed with fennel and a hint of black peppercorns. With such a fantastic flavour, it's not hard to see why it's award winning! This is a whole salami so you can nibble as much or as little as you like. 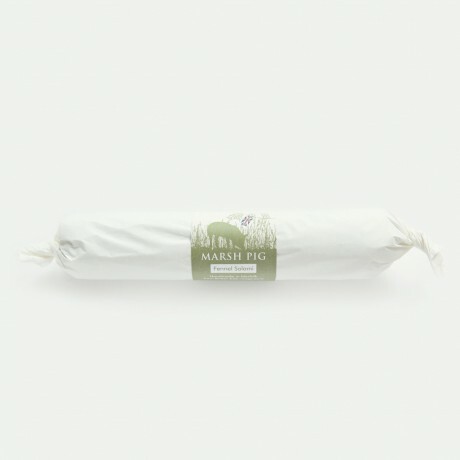 Marsh Pig lovingly craft all their award-winning Free range British charcuterie by hand. They believe only in the highest standard of welfare for British Livestock, and so only ever use Free Range Pork, sourced from within East Anglia. The pigs are reared slowly in the traditional way, living in a stress-free environment. Using the finest quality cuts gives a lower fat content, resulting in charcuterie with a wonderful flavour and no greasy after taste. Shelf life: minimum 5 months. Free range pork 95.56%, salt, black pepper, dextrose, red wine (Sulphite), fennel seeds, garlic, preservative (sodium nitrate). Gluten, Wheat and Lactose free. Let me know when this is available again to buy! The home of multi-award winning artisan British charcuterie.